Due to pressure of work and people on leave here at Liz at Lancaster’s Guesthouse a much anticipated staff celebration of birthdays, staff thank you’s (2016 Lizella top 4 Star Guesthouse award again!) and general chill out with takeaways and maybe beer but most likely orange juice, was cancelled. 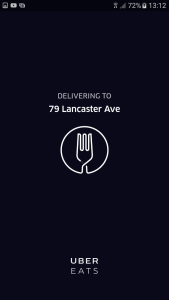 To offset the disappointment it was decided when a gap arose to try for those left behind the UberEATS App and order lunch for everyone still here. We also wanted to try it and pass on the knowledge to our guests. Something we increasingly find ourselves doing – I think if you provide the WiFi you’re seen as the resident expert on all things WiFi! However, take care when helping guests with installing Uber. We had a guest from Tanzania, who had a new phone and issues with his cell phone number, but we have WiFi and also there was WiFi where his conference was. Uber was going to solve a transport problem he had so … voilá install it and get going – but the small issue of cell phone number verification raised its complicating head – well OK ‘I will just use mine’. Mmmm… it took me 3 days, repeated interaction with Uber support, who were very prompt in their replies, and a phone software upgrade to restore my Uber to a working condition while his worked fine for the week. Oh well the guest comes first! But I digress. 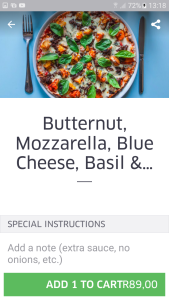 Uber’s new app, UberEATS, allows you to browse the restaurants’ menus, choose and order food, have it delivered to your doorstep from participating restaurants, and pay for it all via this smartphone app. 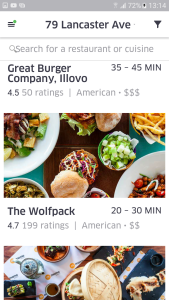 And, in keeping with the Uber app, rate the food and delivery. 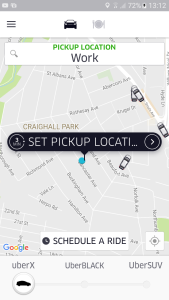 The Apps name may also foretell Uber’s takeover of much of the transport space around Johannesburg these days. While I worry about a huge ‘digital platform’ putting many small business operators out of work (regular cab drivers and now Mr Delivery, Delivery Xtreme, etc. ), if the food can be delivered faster it is a huge advantage. And if Uber drivers here in SA earn the right for basic benefits of medical cover and holiday pay, as it seems they will in the UK, this will be even better. You start by installing the app whose icon is at the top of your Uber app front page. This is for most phones but in some Uber versions there is no Icon. You have to go to your App installer and find UberEATS and install it. The dinner plate with a knife and fork icon – click here and it takes you to the App, or for the first time, to the install app feature on your phone. Then install the app and that’s it. When you open it you will be presented with the default delivery address, which you can change. Next are the restaurants and their menus that are open and nearby. It is very easy to browse the list or search for a specific restaurant. Once you have selected your items you submit your order. The system then tracks the stages visually in the app. I found UberEATS very easy to use. It is actually easier than Uber (I still find it difficult to get the pickup and destination right at times – the system wizzes off with my clumsy unintentional first choice – saw this with our Tanzanian guest too!). 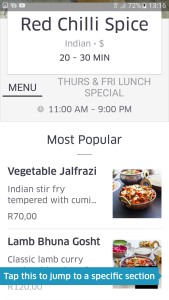 UberEATS has a place for special requests to the restaurant – hold the pickle/ no mayo! The selection of restaurants on the system was impressive. Couldn’t think of one left out and found ones I didn’t know about. There are mouthwatering pictures of the menu dishes. The damage at the end is politely applied to your Uber payment option. I will use UberEATS again – on Payday! I think Mr Delivery also has an app, so one could use that too.